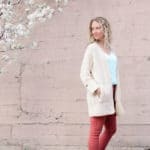 Learn how to make the back piece of this modern, lightweight cardigan in Part 1 of the Alchemy Cardigan Crochet Along. Part 1 of the free pattern and video tutorial are below, or you can purchase the ad-free, easily printable PDF with stitch chart and schematic here. The Alchemy Cardigan Crochet Along is part of a collaboration with my friends at LoveCrochet.com. This post contains affiliate links. Welcome to the first week of the Alchemy Cardigan Crochet Along! 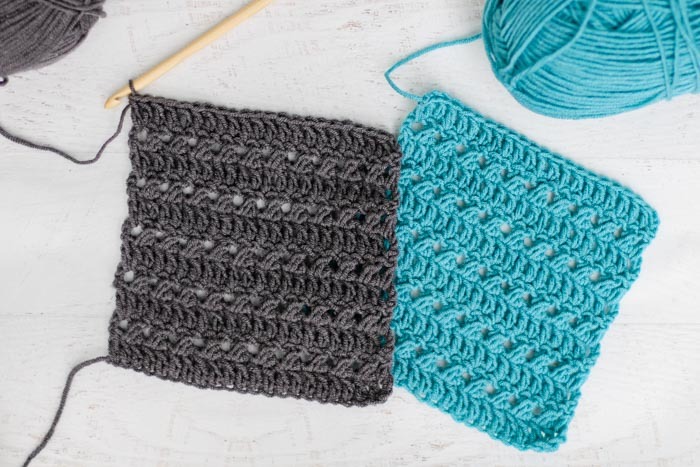 I’m so excited to finally share the first section of the pattern with you and teach you exactly how to crochet it in this week’s step-by-step video tutorial. 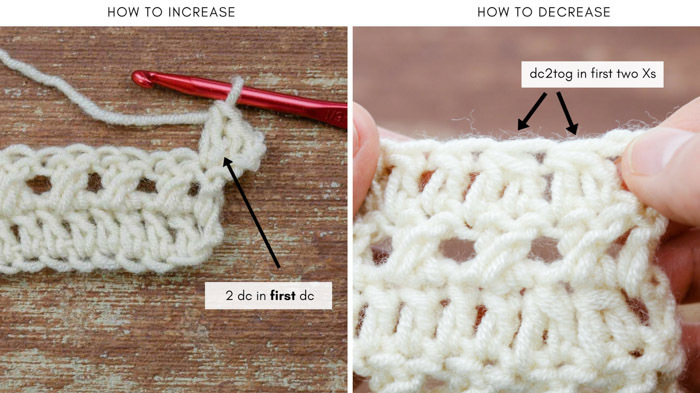 If you’re just tuning into the crochet along, here are a couple of important things to know. You can read more details about how the CAL will work in this blog post. • PATTERN: If you’re a couch crocheter or a visual learner, I highly recommend investing in the PDF version of the pattern. You’ll pay $5 once, but then receive an updated PDF weekly that contains the new pattern stage, plus all the previous stages. 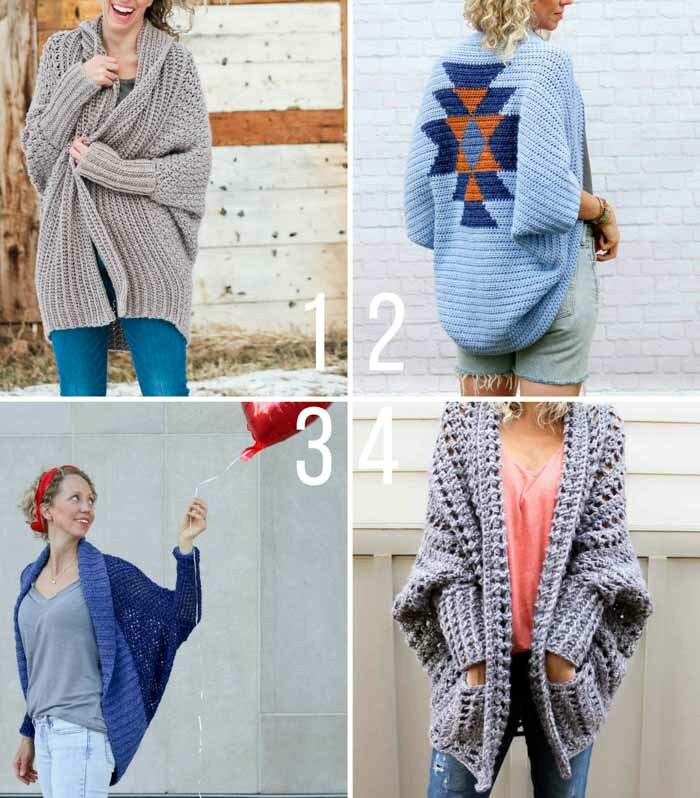 The PDF contains two stitch charts and a schematic with more detailed sweater measurements, plus a few additional charts that are super helpful to less experienced pattern readers. You can grab your printable PDF for $5.00 here. • SHARE: When you’re ready to show off your progress, please share your pics on Instagram with #AlchemyCAL so we’re sure to see your stitches. We’d also love for you to hop into the Love Crochet CAL Facebook group and join in on the crochet along festivities. If you have questions about the pattern, this is a great place to get support too. 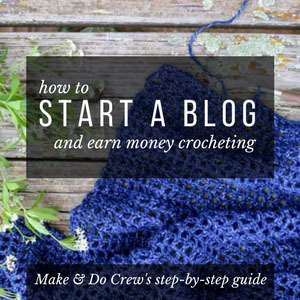 • WHAT’S NEXT: Next week, we’ll learn how to crochet the front two pieces of the Alchemy Cardigan. If you have a busy week or fall behind, don’t worry–the pattern and tutorials will still be available after the crochet along concludes. Let this be a fun journey of crochet sweater making and skill building! How many of you regularly check your gauge or tension when you start a pattern? Yeah, I never did either! Until I invested dozens of hours in to a few knit projects that ended up way too big/small/wide/tall and then I wised up to the importance of gauge. Especially when making something that you want to be a particular size, like a garment, taking the 15-20 minutes to check your gauge is critical. If you’re a newly reformed gauge-checker, I share instructions on how to check your gauge a few minutes into the video tutorial below. Pop over to the Love Crochet CAL group on Facebook to ask any gauge questions as they come up. Okay, let’s do this thang! The video tutorial is directly below and Part 1 of the free pattern is right below the video player. If you prefer a printed pattern, grab the pattern PDF with stitch chart and schematic here. Get your supplies, purchase the pattern PDF and read more about the crochet along here on LoveCrochet.com. Purchase the ad-free, printable PDF with schematic and stitch chart here. 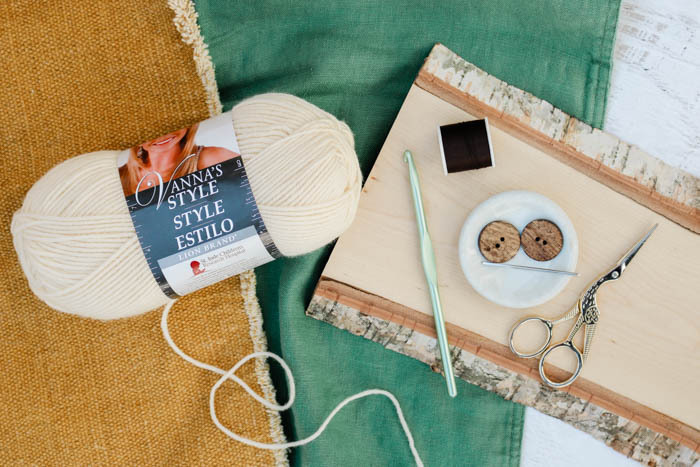 Whether you’re new to garment crocheting or an old pro, the Alchemy Cardigan will transform what you think is possible with a hook, some yarn and your own two hands. This lightweight sweater is perfect to toss on for some summer stargazing or layer with a long-sleeve shirt in the colder months. Worked sideways to create flattering vertical rows, the entire sweater is made with different applications of a simple double crochet stitch (U.K: treble crochet). 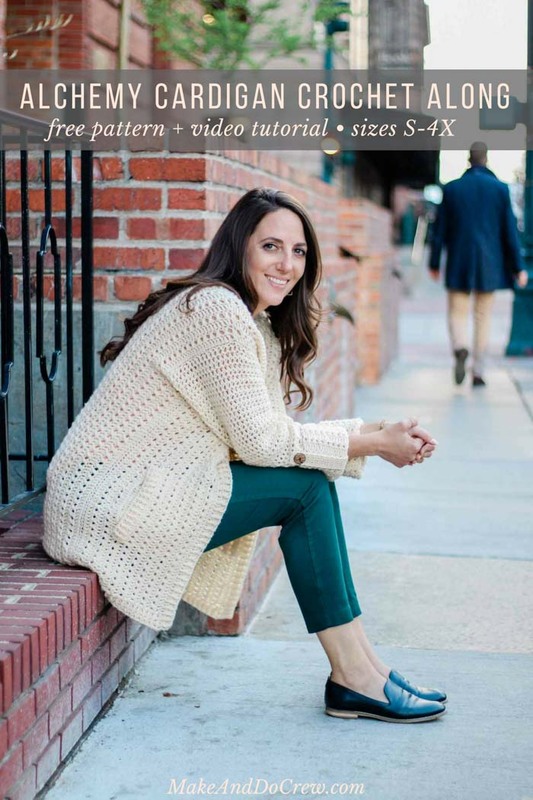 A few modern details, like cuffed sleeves and wooden buttons, ensure this cardigan will be a wardrobe staple for years to come. 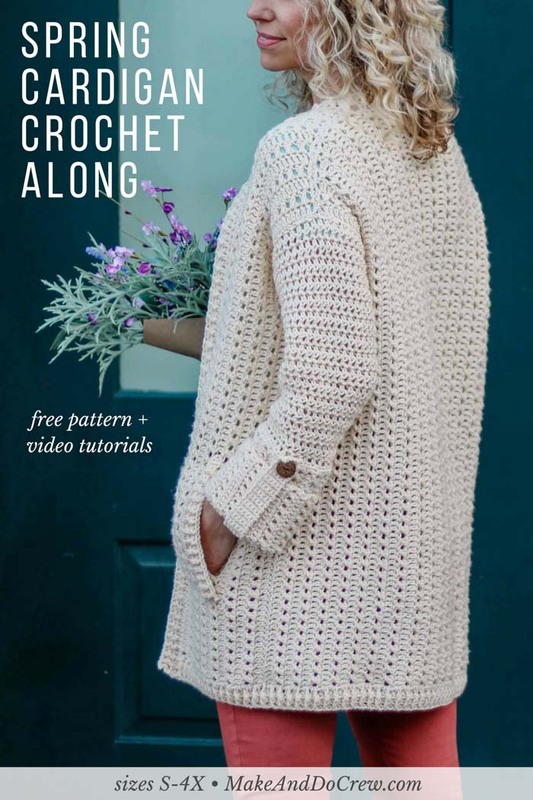 Released in four separate manageable stages, in this crochet along, you’ll learn some new intermediate-level techniques and then have a chance to master them with plenty of step-by-step practice. See schematic in the printable, ad-free PDF for additional measurements. Please check your gauge and adjust your hook size accordingly! 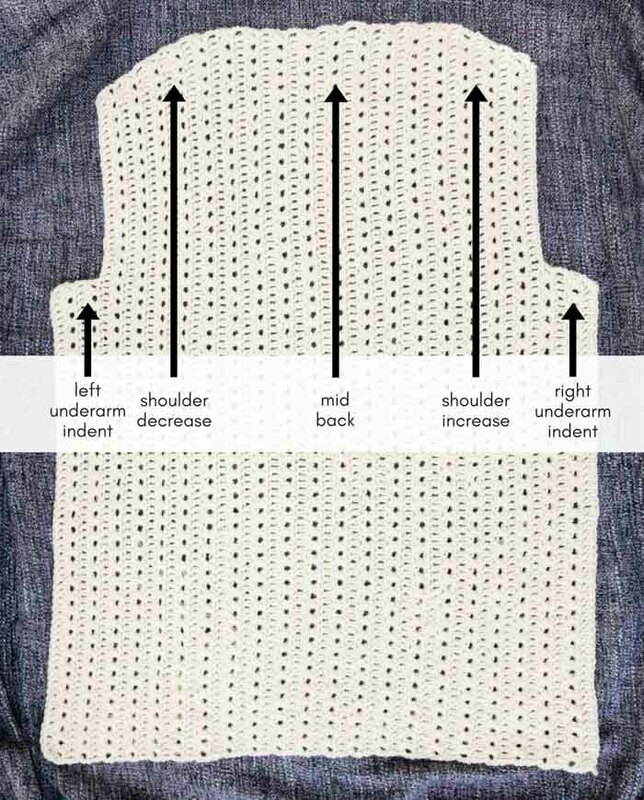 This is critical to making a sweater that meets the sizing listed in the pattern. See first few minutes of video tutorial for explanation of how to do this. • Ch 3 at beginning of a row always counts as a dc. • See photo below for details on how to increase and decrease in the shoulder sections. Foundation Row: Ch 66 (68, 68, 70, 70, 72, 72). Rows 4-5 (7, 9, 11, 13, 15, 17)**: Continuing in established pattern, rep a RS inc Row every RS row, 1 (2, 1, 0, 1, 0, 1) time(s), then rep a RS inc Row every other RS row, 0 (0, 1, 2, 2, 3, 3) time(s). At the end of increasing, there are 94 (100, 102, 106, 110, 114, 118) total dc. **UPDATED TO ADD: Some people have had question about these rows, so I’ve written the row-by-row shoulder increase in layman’s terms for each size below. I hope you find it helpful. These rows are NOT in addition to what’s written above, this is just another way of explaining what is written above in pattern speak. Only work the shoulder increase section once. Rep Rows 1 and 2 (9 (9, 9, 9, 10, 10, 10)) more times each. Work one additional rep of Row 1. Rows 3 (5, 7, 9, 11, 13, 15): Continuing in established pattern, rep a RS dec Row every other RS row, 0 (0, 1, 2, 2, 3, 3) time(s), then rep a RS dec Row every RS row, 1 (2, 1, 0, 1, 0, 1) time(s). At the end of Row 3 (5, 7, 9, 11, 13, 15, 17), there are 90 (94, 96, 100, 102, 106, 108) dc. Counting from bottom edge of sweater, place marker in 64th (66th, 66th, 68th, 68th, 70th, 70th) st.
Row 3 (WS): Rep Row 1. Row 4 (RS): Rep Row 2. Fasten off, leaving a 24” tail for seaming. You’re amazing! In Part 2, we’ll make the cardigan fronts using many of these same skills. Find Part 2 here. We all want to see your progress! Use #AlchemyCAL and tag @lovecrochetcom and @MakeAndDoCrew to show off your stitches and have a chance to be featured. Did you know Make & Do Crew has a new community on Facebook? Join our private group of crocheters here to share your crochet photos, ask questions and get crochet inspiration. 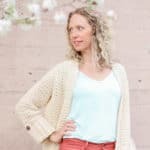 Introducing the Alchemy Cardigan Crochet Along 2018! The Mandala (shades of blue/white) yarn used in the blanket is one skein with all those colors included. So you don’t actually have to technically “switch colors” in order for the stripes to appear. 🙂 A lot fewer ends to weave in that way too! If you click the “Mandala” link in the supplies section of the pattern, you can see exactly what this skein of yarn looks like from the side. It’s beautiful! The pattern uses two strands of that yarn held together throughout. video please? only photos of back + increase/decrease instructions. thanks for sharing this beautiful jacket. anxious to get started. Glad you found it, Dodie. just saw the video – it was not just above the instructions but almost the last item in the post. phew! thanks! I purchase the pattern for $5 and all I receive was the instructions on what was required to make it. If you could help me I would appreciate it. Thank you. I sent the payment to [email protected] on 5-1-18. Thanks for your purchase! The idea with the CAL is that the pattern is updated weekly with the new section of the crochet along. So if you go to your Love Crochet library and download the newest version of the pattern, it’ll include part 1. Part 2 will be released Monday, May 14 and you can again find the updated PDF in your library. Hey Jess, I’m sorry if I am being ignorant but I was wondering why the right side of the back is two rows of decreasing shorter than the left side increase? Thanks for the help. I completely understand why you ask. It’s confusing a bit because of just when the official decrease section begins and ends. (The total rows are the same, they’re just included in the previous and next sections because of how the striping of the dc rows and Xs work out.) Does that make sense? Short answer: The last increase is part of the “MID BACK” and not the shoulder. Yes, it’s two additional dc after the tch. So typically you’d skip the first dc, but to increase you’re working 2 dc in that st.
i purchased the pattern about 30 minutes ago, It is not showing up. so that I may download it. please advise. Here’s a brief article with help and a link to their smiles team. I’m confused. It says free pattern and tutorial. When I follow the link to get the “Free pattern” it says pay $5 for the pattern. That is not a “Free Pattern”, that is a pay for pattern not a free pattern. Where can I get the FREE pattern? I don’t care if it has ads on it. I just want the Free pattern. The first part of the free pattern is directly above this comment area under the pink header. Hi, I’m struggling with the pattern slightly, on row 4 it says to add 30 after the cross stitches, so then row 1 of shoulder increase I dc along and should have 94 but I only have 91, have I missed stitches or was I to add a chain three aswell as the 30 ch.